Theatre has been Mike’s home since he was drafted into the drama club in high school. He has worked in all facets of production including acting and directing, but recognized his strength is in design. To learn more about his craft, he went out to Western Montana and received a Masters of Fine Arts in Lighting and Sound design. His ultimate goal was to teach, but he discovered there was more to learn working professionally so he started a career as a designer and technician. Mike came to the Atlanta theatre community from Montgomery, Alabama where he was working as the Master Electrician for the Alabama Shakespeare Festival back in 1999. His first designs were at the Georgia Shakespeare Festival and he started branching out from there. In 2004, Mike accepted a position teaching at The University of Southern Mississippi. Even though further away, he still maintained his connection to the Atlanta theatre scene. Finally in 2007, Mike moved to Atlanta to work as the Production Manager for the Center of Puppetry Arts while continuing to design. Working primarly in light, Mike’s designs have been seen in shows such as A Midsummer Night’s Dream, Julius Caesar, Cat on a Hot Tin Roof, Richard III, The Glass Menagerie, and Metamorphoses for Georgia Shakespeare, Some Men, Albatross, Slasher, and Xanadu for Actor’s Express, The Bell of Amherst, Conversations With My Wife, and Flyin’ West for Theatre in the Square, Tennis at Nablus for The Alliance, 13th of Paris, Shooting Star and The Legacy of Light for Horizon Theatre, Panhandle Slim and the Oklahoma Kid, and The Man Who Came to Dinner for Georgia Theatre Ensemble and many other shows as well. Lately Mike has branched out in Projections Design and Engineering. Video for live Theatre is a new and exciting field and he’s enjoyed working on shows such as Rudolph the Red Nosed Reindeer, Space!, Ruth and the Green Book, and The Cat in the Hat for the Center for Puppetry Arts, Copenhagen, The Canterbury Tales and Tartuffe for Theatre Arts Guild, The Glass Menagerie for Georgia Shakespeare and most recently Every Tongue Confess for Horizon Theatre. Mike currently teaches for Georgia Perimeter College as the Instructor of Technical Theatre. Through GPC, he also is part of Theatre Arts Guild, being their resident lighting designer as well as a mentor of young professionals as they build skills by working in a professional theatre model. He enjoys watching students grow and stretch in new ways as they discover how theatre works outside the academic community. In 2009, Mike was asked to design Driving Miss Daisy at the Theatrical Outfit. 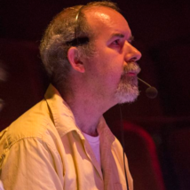 As his first show there, he very much enjoyed the work and was delighted to be offered Cotton Patch Gospel, A Confederacy of Dunces, The Fabulous Lipitones and most recently The Guys where he is also bringing his skills in Projection Design to the process. Each production with the company is a treat and he looks forward to more in the future.